On the eve of Halloween last week I went to The London Fortean Society's special event looking at ghosts, witches and demons of the city. The evening offered four short talks - Roger Clarke talking about Queen Victoria and a child medium she is said to have consulted; Jessie Childs discussing an Elizabethan exorcism in Hackney, Scott Wood offering a virtual London ghost walk and Deborah Hyde talking about The Witch of Eye. All the talks were fascinating, but the one the interested me most was the one about The Witch of Eye, Margery Jourdemayne, who was burnt at the stake in London in 1441. I knew the talk would be good, because not only is Deborah Hyde a very entertaining speaker - as I learned when I heard her talk at ASSAP's vampire symposium last year - her specialist subject is The Witch of Eye. In fact, Deborah uses Jourdemayne as a pen name and her website is at http://www.jourdemayne.com/. The case of Margery, The Witch of Eye, is an unusual one in English witch trials. In England, those sentenced to death for witchcraft were normally hanged, not burnt at the stake. Also, witches of the 15th century were usually poor, elderly women who lived alone and who were seen as undesirables. Margery, on the other hand, was a well-to-do married woman, She was hardly elderly at the time of her trial and she mixed with the upper echelons of London society. In fact, that was part of her downfall. Margery had quite a reputation for providing love and fertility spells to wealthy nobles. She became closely associated with Eleanor Cobham, Duchess of Gloucester and wife to Humphrey of Lancaster, the first Duke of Gloucester. Humphrey was closely in line to the throne - he was uncle to the young Henry VI and, if Henry died, could have become king. His wife Eleanor was ambitious - and also had enemies. Eleanor, Margery and some others were accused of trying to plot against the king using witchcraft. Although Eleanor and Margery were both found guilty, Eleanor got away with doing a penance, but Margery was sentenced to be burnt at the stake. The reason she had a nastier death than hanging was that her charge included heresy and her act was also considered treasonous. Both heresy and treason were things you could get burnt at the stake for under English law. It is a fascinating, tragic and unique story. If you missed Deborah's talk about the Witch of Eye you can find out a bit more on Deborah's website, and you can also read about the historic witch trial in a book I recently reviewed called The British Witch - The Biography. 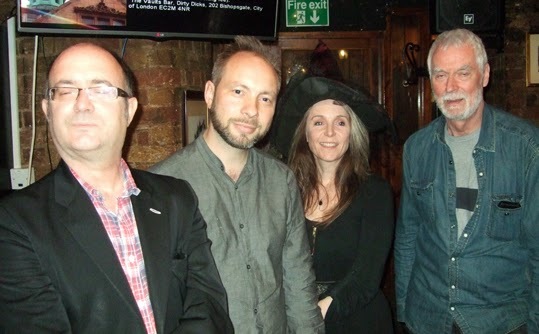 The photo at the top shows Roger Clarke, Scott Wood and Deborah Hyde with David Barrett of The London Fortean Society.